Place the curd and the sugar in a mixing bowl and whisk it until frothy. Divide the curd and sugar mixture into two batch, cover, and process for 1-2 minutes. Transfer and repeat for the second batch. Pour the beverage into 4 chilled glasses. 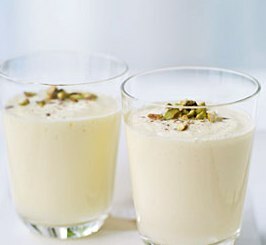 Carefully place a piece of curd cream, if desired, on each drink and garnish with a sprinkle of sugar.